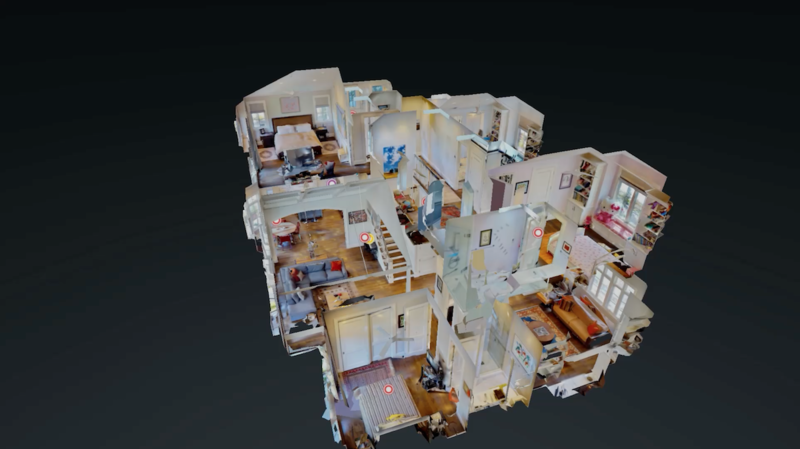 We are happy to be amongst the first estate agents in the area to invest in the innovative Matterport 3D camera and associated imaging software. In less than one working day after recording we can bring your property to life and provide our buyers with a sensation of passing through your property from room to room. Three different views of your property are generated. We bring your property to life with an immersive, interactive 3D experience. Anyone can explore your home 24/7, without the need for a home visit. Visitors to our website can use Dollshouse View to see a whole property in three dimensions. They can then move to walk through the rooms as if they are actually inside the building. The association between the different rooms is clearly demonstated as is the relationship of the interior to the outside spaces. This information can be important to many prospective purchasers who need a particular distribution of rooms or for example want to see the swimming pool from their lounge area. A third benefit of our technology is to offer a Floorplan View for a traditional top-down perspective to give a clearer idea of room dimensions. Our website visitors can access all of this information 24/7 via computer or mobile device providing them with access to your home without the need for a home visit. 2 Negative evaluation of your property in that they can see clearly that the property will not fit their requirements and therefore will not WASTE TIME with a viewing that leads to nothing.